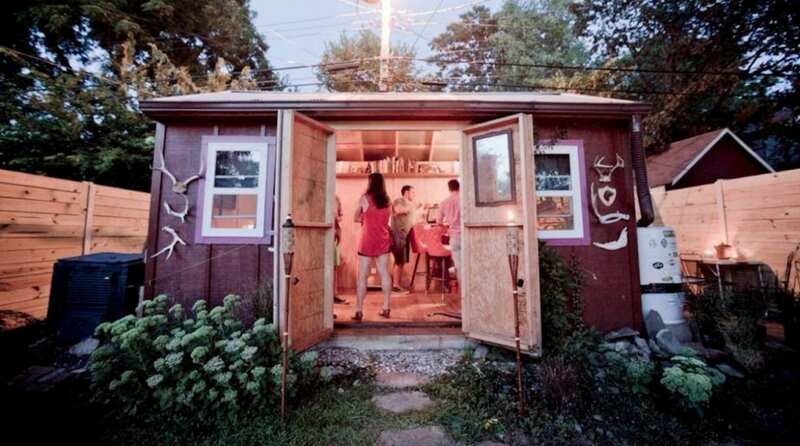 Most people see a shed in their backyard and think about storing garden tools or a lawnmower. But Chris Ceisel and his wife Cristin Llewellyn had a very different vision in 2011. They saw a bar. “It was this intimate space where people keep repeating to us that it ‘felt like they were no longer in Kansas City,’” Ciesel says. The Campground, a cross between a speakeasy and an urban retreat, was born in their Hyde Park backyard in 2011. Ciesel’s experimental concoctions with bitters and syrups and brandied cherries brought people into the wood-paneled nook adorned with antlers and horseshoes and flanked by tiki torches. And somewhere over the last four years of conversation with drinkers sitting on bead-boarded orange stools, The Campground outgrew the shed. “People wanted to see more and we wanted to do more and had something had to give,” Ciesel, who currently works as a nurse, says. When Gregory Kolsto, the owner of Oddly Correct – the five-year-old coffee shop and roasting operation on Main – approached Ciesel about a small, unused space at 6 Westport Road, he saw it as a chance to find out if his avocation could become his vocation. The Campground will be part of the bridge that is connecting a pocket of development on Main Street – anchored by Oddly Correct and the Redeemer Fellowship church – with the revitalization of Westport. Ben Jones and Felicia Koloc opened Maker Goods, a small weekend shop that sells design and paper goods, at 10 Westport Road this spring. In 2014, The Drugstore an open arts studio space opened to the public in the former Katz Drugstore space, which is owned by Redeemer. “I think we’re going to provide a good service for the neighborhood and the city. We’re coming in as newcomers on the scene and I hope people dig it,” Ciesel says. The space is currently raw – soundproofing is still on the walls from its last use as an improvised recording studio. Ciesel needs to obtain architectural renderings of the space before he and his wife apply for a liquor license. In May, The Campground held a small pop-up in the space that is only a total of 400 square feet – 200 of which is in the basement. The Utilitarian Workshop, a local design firm that has helped create the look for Port Fonda, Thou Mayest and the recently opened Heirloom Bakery & Hearth, will be tasked with bringing The Campground to life. Ciesel figures they’ll be able to fit 12 barstools and perhaps have an addition few spots along a rail on the opposite wall. “We want it to be manageable and we don’t want to get in over our heads,” Ciesel says. He wants to keep the menu small with 10 cocktails and possibly six beers on tap. Ciesel will also be consulting with Aaron Post, the owner of The Valkyrie, a three-year-old craft cocktail bar with a strong following in Tulsa, Oklahoma. The couple is hoping to build out a space in the basement to create a cellaring program, wherein bottles of beers are intentionally aged to bring out different or nuanced flavors. Both Ciesel and Llewellyn share a love of beer – particularly sours. He’s an avid homebrewer and she’s a former server at the Flying Saucer Draught Emporium. On the food side, The Campground will also keep it simple with what Ciesel terms “camp-inspired snacks.” Think handheld salty or sweet bites that don’t require a kitchen onsite. Ciesel hopes to open The Campground by next spring – the couple launched a Kickstarter campaign last month to try and help fund the project. But in the interim, he keeps going back to the night of the pop-up in May when the line stretched out the door at 6 Westport Road toward the intersection at Main. “It was amazing to see people out on the street and walking on the sidewalk as opposed to a dark and empty corner of the city,” Ciesel says.